About: You can picture the perfect marriage in your mind, but re-creating it in reality doesn’t come easy. Trusted counselor and relationship expert Dr. Gary Chapman reasons that the most sought-after ingredient in any marriage is true oneness. In The Marriage You’ve Always Wanted, he presents expert wisdom and common sense methods to establishing true unity on emotional and practical levels in marriage. Discover the wit and insight that makes his worldwide presentations and marriage conferences so popular. Are you trying to change your spouse? Do you know what it means to really love someone? Do you feel ignored or even alone in your effort to improve your marriage? Dr. Chapman has answers and action steps on topics from expressing your emotions to managing your money, all in a format that will have you and your spouse talking and learning with every page. My Review: I am a firm believer in taking time to read books about marriage. While my husband and I have a healthy relationship, I know the only way to keep it that way is to be actively working to improve what we have. 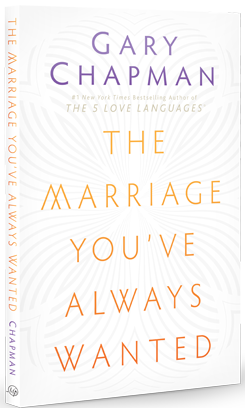 The Marriage You've Always Wanted pointed out many of the things other marriage books focus on, but Chapman's writing style is easy to read. I like the "your turn" homework sections at the end of each chapter. The questions found there are great springboards for discussion and thought. Marriage is hard work, but it's rewarding work. The Marriage You've Always Wanted is a book for every married couple. Don't wait until your marriage is falling apart to do something to keep it together. Start now. My Recommendation: I recommend this book to every married couple whether you've been married a week or several decades. Book has been provided courtesy of Baker Publishing Group and Graf-Martin Communications, Inc. Available at your favourite bookseller from Moody Publishers. (c) Christina Banks 2008-2011. Picture Window theme. Theme images by bopshops. Powered by Blogger.